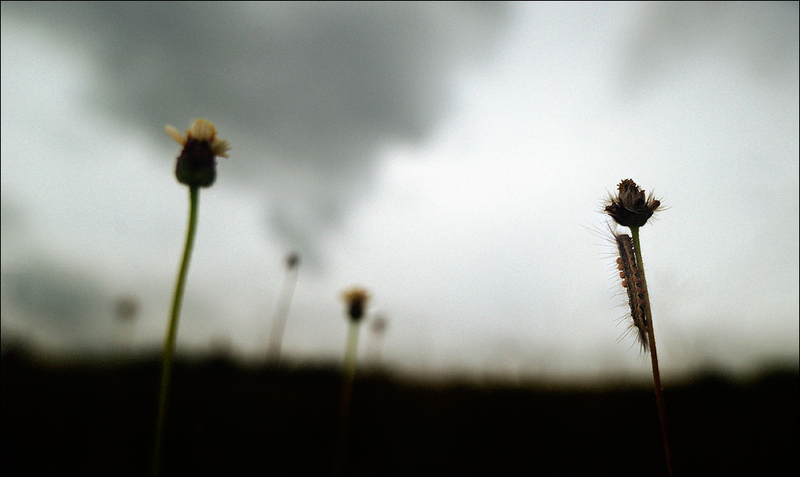 Made this image today morning - spent some time doing wide angle macro work. Chose the narrow dof to render the flowers softer. Thanks for your views.. Excellent Ganesh, I love the way you have mastered this, only those who have tried it will understand how you control the DOF but bring in so much of details in the subject. Another very interesting part is the way the spiny hairs on the caterpillar and the flower are standing out so defined. Together they too appear to be a good subject to generate some perspectives. Here is the color version. Which on works better for your taste buds ? For this image Ganesh, I would go with the monotone . I love the grains in the color one, was just feeling may be if you could have retained those grains in the monochrome version as well ?? What do you think ? I would have loved the color version equally if the flower petals on the right looked like the one's on the left which has lovely soft muted tones of yellow. But since they lack real colors on them, the monochrome does better justice. These are my thoughts, but I like the details on the caterpillar more in the colored version. Overall considering all points, I think the monochrome wins. Thanks Nilanjan for your feedback. may be if you could have retained those grains in the monochrome version - is interesting comment by Nilanjan. Looking into other's work and getting comments by others sometimes may lead to think otherwise than what 'orginality' an artist can bring into his/her creations, it is happening to me. But can we stop looking into wonderful creations like these ? May be B&W won't have that issue in this case ? Thank you all friends for your views/suggestions..